Dr. Bob practices Holistic Chiropractic Care, along with nutritional assessment, allergy elimination, emotional techniques, cranial-sacral therapy, trigger point therapy, and cold laser therapies. Our practice is prevention oriented and our staff is dedicated to the continued improvement of your health. Doctor Bob grew up in Boston, Massachusetts and attended school in both the Bay Area of Northern California and in Washington State. He served in the United States Air Force and is a Vietnam Veteran. Bob originally moved to Alaska in 1981 to build houses. He worked here approximately 10 years before leaving to attend Life West Chiropractic College, graduating in 1994. In his spare time, Dr. Bob also enjoys music, woodworking, Harley riding, the Boston Red Sox, and the New England Patriots. Tyrell A. Sellers is an Alaskan through and through; he enjoys hiking, fishing and camping in the outdoors with his family. Tyrell was born and raised right here in Anchorage and cares about his community as a whole. This is also how he treats his patients, as a whole not a sum of parts. 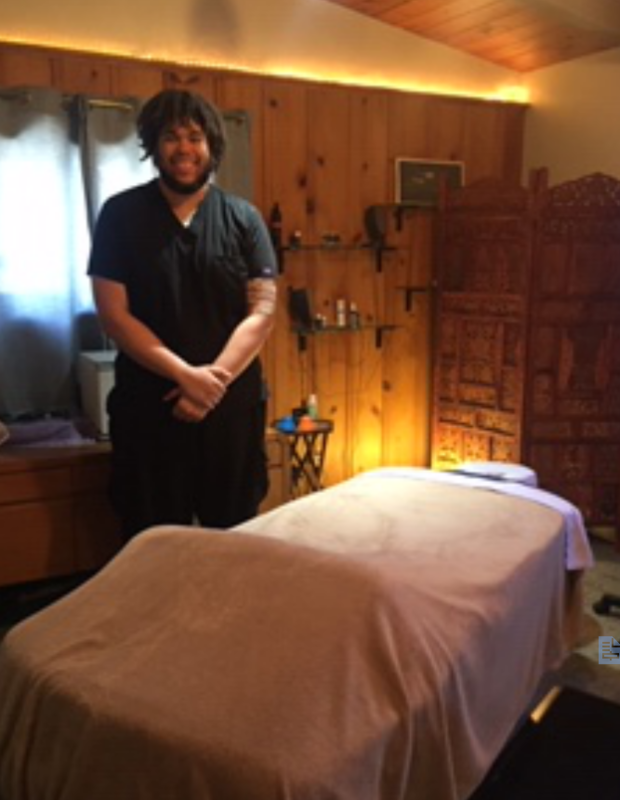 He has over two years’ experience in massage therapy specializing in Deep Tissue Massage, Trigger Point Therapy and Certified in Medical Myotherapy Massage. Tyrell strives to be intuitive, active and engaged in patient sessions in order to quickly identify patient problems and needs. Specializing in tail wags and warm greetings. Bluey is a Weimaraner and Drake is a Yellow Lab.